Two years ago, on the 150th anniversary of Carl E. Akeley’s birth in Clarendon, New York, the local historical society hosted a birthday celebration and invited some of Akeley’s biggest supporters to speak. (More info here.) It was at that meeting that John Janelli’s long held dream of erecting a permanent monument on American soil to the father of modern taxidermy, finally germinated into reality. 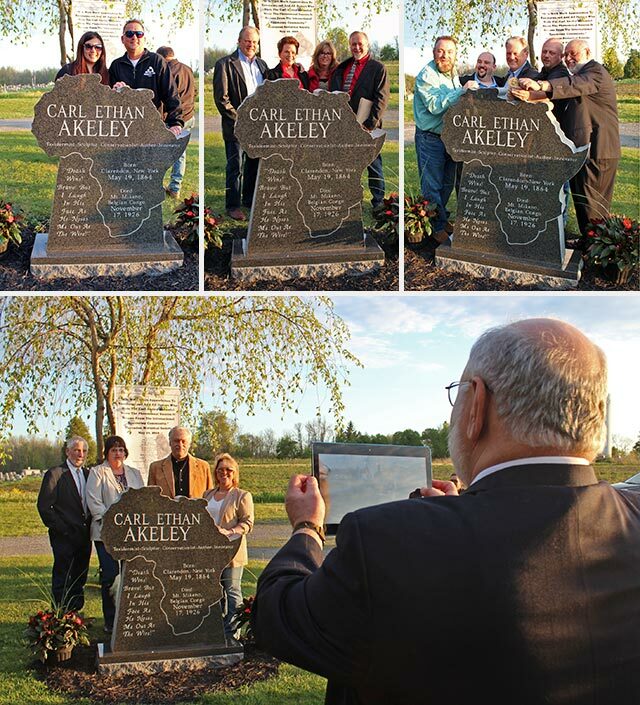 Two years later, on May 19, 2016, with the help of Clarendon Historical Society President Melissa Ierlan and the generous donations of taxidermists on the Taxidermy.Net website, John’s vision was realized with the dedication and unveiling of the Akeley Memorial Stone. 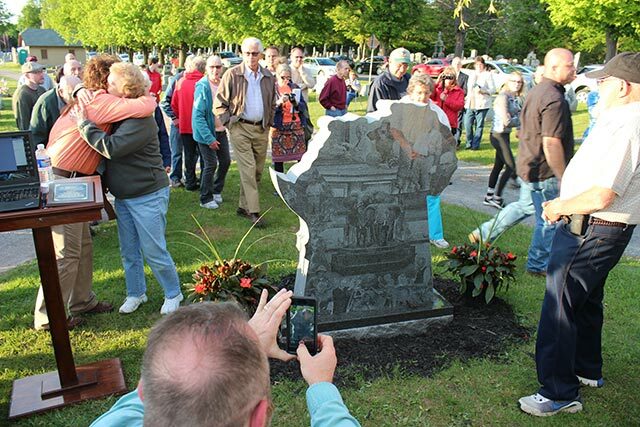 After an American Legion 15 gun salute, and as composer Jerry Goldsmith’s rousing score from the movie “The Ghost and the Darkness” played in the background, John and Melissa unveiled the African granite monument in a stirring tribute on a beautiful spring afternoon. Excitement ran through the crowd as each person made their way up to the monument to inspect the details and have their photo made alongside it. The turnout was really phenomenal. Taxidermists from all over the country made the trip to upstate New York to be a part of this dedication ceremony. After a barbecue dinner and social hour hosted by the Clarendon Historical Society, we reconvened at the Hillside Cemetery, listed on the National Register of Historic Places. At the end of two roads in a teardrop-shaped roundabout, in front of a lone weeping cherry tree, the African black granite stone monument stands as tribute. Mike Orapollo made this panoramic photo on his iPhone right before the unveiling. A list of the donors was displayed. These names will soon be inscribed on bricks in a walkway leading up to the monument. 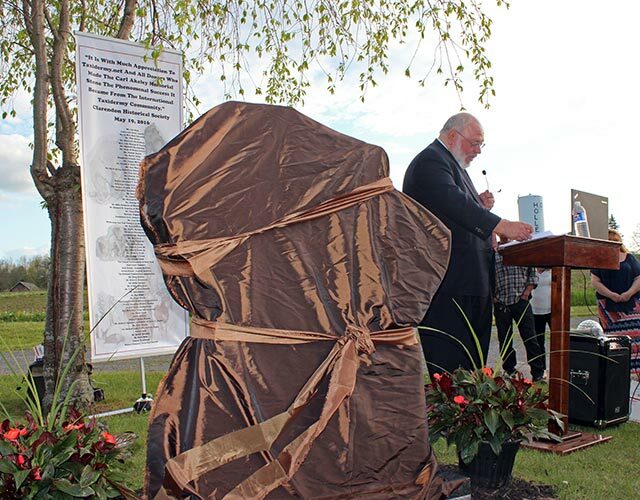 John Janelli gave the keynote address before the unveiling of the Akeley Memorial Stone. It’s hard to imagine, 152 years ago, a baby boy was born in this town of Clarendon, who later would roam these very hills with a shotgun and note book. Who grew into a handsome teenager knowing no limits as to what his life’s work would be, starting with a borrowed taxidermy book and a little lifeless canary. Only to evolve into an “Old Man” who forever changed the way the world would embrace natural history all while unleashing the highest possible standards in the art of taxidermy – for his day and our times as well. In the wake of his untamed life, he would leave the rippling effects of an innovating genius, an “almost” fearless explorer and a most realistic conservationist long before the very meaning of the word was ever remotely defined. I say “almost fearless” because the only thing Carl Akeley was ever truly afraid of was water. He never knew how to swim claiming he never had time to learn. Carl Ethan Akeley; a man who wrote the music and the words while knowing the exact chords to pluck on the heart strings of those who would grant his greatest wish; the first national park in all of Africa. Known today as Virunga National Park which not only became the model of all future wildlife sanctuaries there, but it had one specific purpose; to save the Mountain Gorilla, that Akeley, better than any man knew and respected, from extinction. Through the protection of its wild and natural habitat, he lead the way for George Schaller, Dr. Louis Leaky, Dian Fossey and Jane Goodall, all four of whom who would later accredit Carl Akeley in all their books written about the species. Taxidermists have always asked, why him? Why Carl Akeley? The answer is very simple. Because we as an industry need to know who we are and who was responsible for us getting this far in a profession that has captivated an international community of wildlife artists for over 250 years! Carl Akeley was the compass, long before there was a GPS for our industry that he never imagined would be so technologically advanced within only two generations after his birth. Surely there were others like him. But as the pages of history records, there was only one Michelangelo Buonarroti; only one William Shakespeare; only one Christopher Columbus; only one John Glenn, and like Carl Akeley, only one North Star. As ironic as this may seem, standing with us today are some of the finest taxidermists our industry has ever produced. And then there’s our very own Melissa Ierlan at our side too. If right now Carl Akeley was taking applications for a brand new museum or planned to update any of his former masterful dioramas, Melissa would no doubt be hired first and here’s why; Mr. Akeley would never employ anyone based solely upon their knowledge of taxidermy because he didn’t want anyone second guessing him or his techniques. He would rather teach someone from the ground up rather than to learn about someone else’s trials and errors on the ground floor. All that and more brings us to the Carl Akeley Memorial stone, which we see here before us today. It would take more than a few hours to mention everyone’s name who has been a beacon of support and encouragement that made this project possible, but suffice to say it all began just two years ago when Erin Anheier suggested to Melissa Ierlan to phone an Akeley-maniac in New Jersey, who phoned his Goomba, Mike Oropallo in New York, to come say a few words about him at Carl Akeley’s 150th birthday commemoration. One thing lead to the next and before long, a plan was drawn and a dream was born. Just one email to Ken Edwards, the mastermind of Taxidermy.Net, and it was all put in gear. From there the Clarendon Historical Society supplied the steam while you, our very dear friends provided the financial fuel. Ms. Barbara Mathe, Greggory Raml and the entire staff at the AMNH Special Collections department who literally helped us with anything we needed to be used on the back of Mr. Akeley’s monument. Ms. Eileen Westwig in the AMNH Department of Mammalogy, Mr. Tom Gnoske and Mr. Mark Alvery of the Field Museum of Natural History, Explorer’s Club staff, Ms. Lacey Flint, Ms. Emerald Nash and executive director Mr. Will Roseman. Last but certainly not least, Ms. Wendy Christensen, of the Milwaukee Public Museum of Natural History. Finally, thank you to everyone who made this opportunity possible for Carl Akeley! Next, John read a letter from John Jackson of the Conservation Force. The text of the letter is reproduced below. Little is known of the enormous role taxidermists have always played in the world of conservation. Nor does the average person fully understand how sustainable wildlife can in fact be conserved by actual taxidermy at all. Therefore, it is the non-hunters and non-taxidermists who are relying upon your industry to not only define the conservation ethics of your profession, but to exemplify conservation on every level of your careers. Currently, severe restrictions both federal and state, are threatening your very existence as professional taxidermists. Social media is choking the life out of your hard earned livelihoods, hoping to replace the wise use of otherwise abundant renewable wildlife resources with that of domestic animal husbandry and poorly managed land holdings. Every pro-hunting country of Africa has been thoroughly biologically educated by American safari hunters through the licenses, trophy fees and outfitter expenses. Yet, nothing really has changed much since Carl Akeley prophesized that human population explosions coupled by improper land management would only lead to the mass destruction of both habitat and wildlife alike. A prophet does not predict the future, he prepares for the future at all costs. Together, we must prepare to prevent the social media attacks of tomorrow. No other industry could rightfully safeguard the legacy of which Carl Akeley left upon wildlife conservation as the fascinating world of taxidermy. This monument is but cold granite if you walk away from it with no further concern for the future of your industry. All of you came together to fund this magnificent and respectful token of admiration for Carl Akeley, and you are to be applauded for that alone. It is said that the memory of great man will always belong to those who follow his visions. Today, in keeping with Carl Akeley’s vision, Conservation Force offers your industry a chapter unto yourselves that will be known as “Taxidermists For Conservation”. Think about it, talk about it and act upon it. For over 100 years, it has always been taxidermists that were the first crusaders to save our international wildlife. Who will lead the crusade to save the international taxidermist’s industry now that Carl Akeley’s legacy is written in stone? Bravo to the Clarendon Historical Society and to all the donors for a job well done. John then read a letter from Craig Lewis, the Chairman of the United Taxidermists Association. The text of the letter is reproduced below. 16426 – Fourth Section Rd. 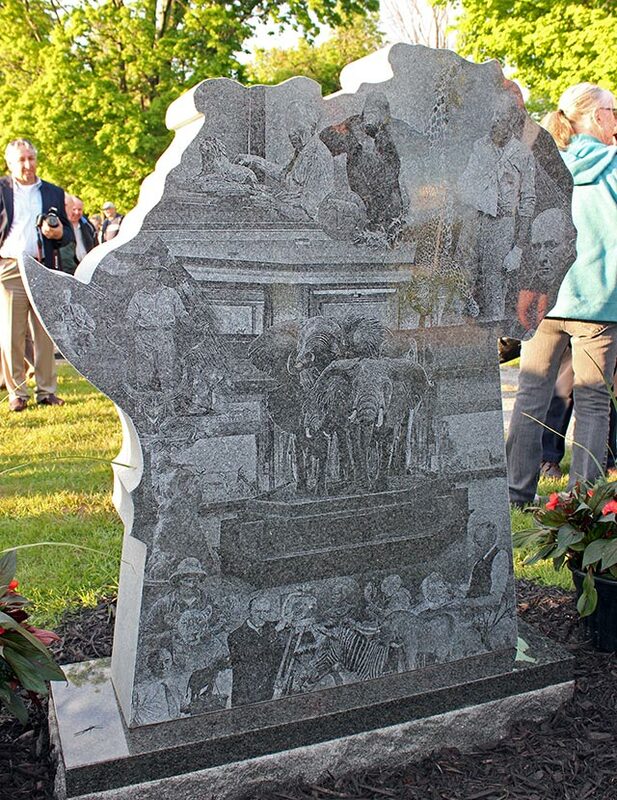 On behalf of the United Taxidermist Association, it gives me great pleasure to commend and recognize you and the Clarendon Historical Society for coordinating the Carl Akeley Memorial and bringing the beautiful granite memorial monument to Clarendon. As President of the Clarendon Historical Society, you were the catalyst for this tremendous project, ensuring it was accomplished with great reverence and appreciation for the iconic work Carl Akeley did and the extraordinary place he holds in taxidermy history. Your personal work and ambassadorship have been extraordinary. As such, it gives me great pleasure in telling you that at its April meeting, the United Taxidermist Association Board of Directors unanimously voted to award you the very first life time honorary membership with all associated rights and privileges thereto in the United Taxidermist Association. Your dedication and perseverance to recognize and honor one of the great leaders and icons in taxidermy reflects the highest personal and professional standards. Your work to ensure the memory of a very special man and the industry he so loved will go on in perpetuity and will be a lasting legacy for Clarendon and taxidermists around the world. Then it was time for the unveiling. While the afternoon sun still shone brightly at 7:30 p.m., an American legion honor guard offered a 15 gun salute and a bugler played “Taps.” Then, as the soaring music from “The Ghost and the Darkness” reached its crescendo, John and Melissa removed the covering and the Akeley stone was finally visible. Members of the American Legion Post #529 offered a salute followed by John Janelli and Melissa Irelan unveiling the Akeley Memorial Stone. The crowd poured in to see the monument up close. Emotions were high and hugs were all around. Some of the many taxidermists who travelled far and wide to attend gathered for this group portrait. 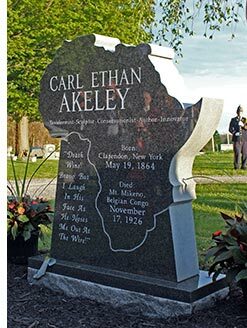 The back of the Akeley Memorial Stone was engraved with a collage of photos depicting monumental moments and works from Carl Akeley’s life. The Akeley Memorial Stone quickly became the new cool place for taxidermists to have their photo taken. If you are ever travelling near upstate New York, enter this address in your GPS for the location of the Hillside Cemetery: 4047 Holley Byron Rd., Holley, NY 14470. I would like to express my deep appreciation to the members of the online taxidermy community. When asked by John Janelli to step up and fund this monument, they came through and made it happen. To the donors who contributed, you are all a part of this permanent tribute to the father of our profession. Thank you for helping to create something that will outlive us all and remind future generations of our respect for the past and the path that lead us here. To John, whose vision and tenacity set this in motion, to Melissa, who secured the site and ran with the project, to each person who contributed to its completion, and to every person who attended the unveiling ceremony to help celebrate this occasion, a heartfelt thank you. I think Mr. Akeley would be appreciative as well.